Given triangle ABC, parallel lines DC and EA are reflected in BC and BA respectively. 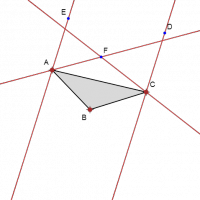 What is the locus of F, the intersection of the reflected lines? (This problem comes from Alex Turzillo’s project entitled “Geometric Measure of Aberration in Parabolic Caustics”).